The first street railways of New Orleans, which commenced in 1835 and by 1836 comprised three routes and two corporations, did not operate a connected citywide service. A proposal for such a street railway “from one extremity of the city to the other, giving at all times and in all states of the weather, the most speedy, cheap and agreeable means of accommodation to the inhabitants soon to connect the Carrollton RR in the 2nd Municipality to the Pontchartrain RR in the 3rd Municipality” is the earliest research has found (B Oct. 30, 1845). Seven years later, Mr. H. R. Hill proposed a system running “from one extremity to another...even to Metairie Ridge, eventually to Lake Pontchartrain” (DP 12/18/1852 and 12/22/1852), and “to unite in iron bonds this whole community...using grooved rail too narrow to catch carriage wheels or feet...[with] cars to be constructed in a light, airy and elegant style” (DP 12/3/1852). Support in city papers persisted, suggesting in one article the city should own the citywide system, provide depots and cars, and lease it to a private contractor, requiring the firm “to keep the RR in good shape” (DP 1/8/1853). The supporters of this project obtained sympathetic news stories for the next four months, then the issue slid from public discussion for three years. The N. O. City Board of Aldermen tried to revive the citywide system, calling for a “double track RR from the upper limits”, crossing Canal Street, “to the Tobacco Warehouse”, near the U. S. barracks (DP 1/16/1856). Finally, in 1859, there were enough diverse and wealthy investors to incorporate a large, comprehensive street railway system. This was the “City RR” — correctly, the “New Orleans City RR Co.” Omnibus operators J. B. Slawson, Frederick Wintz, Henry Hart, and Patrick Irwin headed the list of stockholders of this undertaking. Mr. Slawson owned 2000 NOC voting shares; the other three gentlemen owned 1000 shares each. The four thus controlled the corporation. At mid-year 1860, the NOC officers were: J. B. Slawson, President; P. Sinnot, Secretary; and S. L. James, Engineer and Superintendent. Eaton, Gilbert & Co. of Troy, NY built the NOC's first cars (DC 9/8/1860), which arrived in late summer of 1860. The company immediately displayed one of these Gilbert cars on several blocks of tramway on Camp St., Canal St. to Girod: “First car on City Railroad yesterday...quite a show on Camp St....a brace of omnibus mules hitched to it...on polite invitation of Mr. Wintz, crowds rode on...the car [which] rolled with quiet, easy motion.” Inside, longitudinal seats easily had room for 18 sitting riders “with ample standing room...bars and straps (for standees) and platforms accommodate more...shipped, wheels and all, from Troy, NY. Large two story cars to come when City Railroad completed.” Four days later: “The City RR provided free rides again yesterday, trotting crowds up and down Camp Street” (DC 9/12/1860). 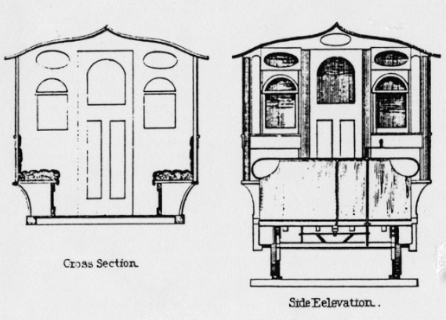 The walking beam experimental car (P — S p. 15) is one of the 1859 Eaton-Gilbert platform cars that made demonstration runs on Canal Street as described. This is the only photo of these cars so far found. These twenty cars, numbered 1 to 20, were not bobtail, but were platform cars, with AR and PM. The NOC bought no more platform cars, instead — surely on Mr. Slawson's insistence — filled out the original NOC roster with one-man bobtail cars. The big platform cars, in busy, heavy service, required a crew of two, adding a conductor to the driver. The City RR needed more than 20 cars, and the second order was for 45 BT BR PM cars from Stevenson, 14' body, 6 sections and 6 windows each side. Numbers began with 21. These cars (with poss. a third order of approx. another 45 from Stevenson) arrived after Fort Sumter was fired upon. A permit from the U. S. Secretary of War released the cars, after being held at Louisville, in late spring of 1861 (K). River steamboats with two flat boats did the job. It was possible in 1861 for freight shipments to reach New Orleans from New York via inland waterways, lakes and rivers. This might explain the cars on the Ohio River. The NOC completed its system in summer of 1861 and immediately felt a desperate need of more cars. Crowds of riders overwhelmed the fleet of Gibson and Stephenson cars. The DD cars did not operate on City RR because the city's citizens refused to allow tree trimming (DC 6/3/1861 p. 1). Slawson put an ad in the papers “for acceptance, sealed proposals, until July 3, to build 50 City RR cars to our specifications” (DC 6/29/1861 p. 3). In just days, a reporter noted, “railroad company at work putting omnibus bodies on railroad wheels...these unique carriages will be used until the proper kind can be made.” Number of omnibuses rebuilt unk., all unceremoniously discarded in a weed-grown lot in 1866. All City RR cars used fareboxes which J. B. Slawson invented and installed in all omnibuses of his “Rough and Ready Line.” Slawson was president of the NOC and was fiercely loyal to the Confederate States. After New Orleans fell to Union occupation, he had to leave the city. He refused to lower his Confederate flag, and avoided arrest by moving to N. Y. City, where he joined the staff of the John Stephenson Co. After Mr. Slawson departed, Mr. Henry Hart became the road's new President (DTD 5/27/1863). The Hart family were impressive street railway promoters, operators, and innovators. The City RR ordered unk. no. 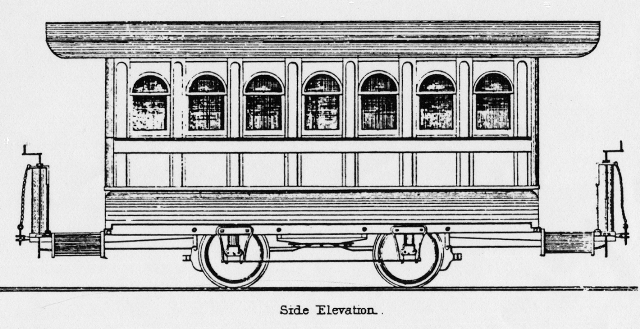 of cars from Stephenson (7 sections, or 7 windows each side) in 1866. Starting that year was another car RB project, adding one section to each car body to convert all 14' cars to 16' bodies. Sections came from Stephenson. NOCRR experimented with adding two sections to make 18' car bodies, but soon discontinued the idea. Unless the PM were placed further apart, the cars would be unsteady, while a longer wheelbase would find sharp curves a major problem. The NOC Annual Report of 1867 mentioned the one-section RB program almost complete, listing 140 cars, 647 mules, and 3 horses. Wooden seats replaced cushions, poss. because heavy use and N. O. humid weather caused fast deterioration of expensive cushion seats. The harsh business conditions after the war, under military occupation, called for a penurious expense account. Another annoyance was “the circulation of depreciated and irregular currency plus counterfeit nickels” (!). There was a one thousand dollar reward for the capture of anyone involved in passing bad money. Nickel fare tickets were being used for money, and also counterfeits of them were showing up in fare boxes. The 13th NOC Annual Report (1873) reflected two distressful national economic crises: A sharp business decline began that year, and the epidemic of horse and mule lung disease (the epizooty) killed many animals and caused service interruptions. There was a decrease of 1,128,135 riders over 1872. The company was “losing $2,500 annually” due to bad money. About 137 people daily (almost 50,000 annually) passed counterfeit money and tickets. Yet, the NOC began building “open excursion cars this year.” These were BT PM BR 14' cars, poss. RB Stephensons, for the total number of cars did not change. By 1874, the NOC had built eleven “open excursion cars this year” (surely the RB Stephensons) and listed 141 cars, 671 mules, and 400 men on the company payroll. The eleven “new” cars were “open” by replacing waist panels with wire screens and installing roll-down canvas curtains. The NOC also owned PM 14' open top freight cars (see S p. 54 caption, P in S p. 55 foreground) to carry feed from the Canal St. station where “dietitians” prepared feed for the various car barns' mule populations (Esplanade, Poland, Prytania, and Magazine). The 1874 annual report complained of persistent bad business conditions with half a million fewer riders than 1873 and the pain of continual counterfeit nickels! The NOC reorganized as the N. O. City & Lake RR Co. on May 3, 1883. It owned 148 streetcars (BT PM BR — all Stephenson; disp. of Gilberts unk. ), 9 engines, 40 cars (coaches), 7 floats, 12 carts, 1 dray, 2 baggage cars, 3 “wagons” (mule feed cars), and 2 flat cars...50 miles of track, 645 mules, and 27 ponies (no explanation of ponies' duties). This is recorded in RCOB 120, Folios 123-131 of June 7, 1883. With two great events looming for 1884-85-86, the Cotton Centennial and the North-South-Cent. American Exposition, the NOC&L began ordering new cars, mainly for the Magazine line, which would carry most of the crowds to Upper City Park (now Audubon Park) where the long-time events were planned as main sites (DP 9/8/1883). On 9/11/1883 one of the new cars left the Clay Statue with Acting President Charles E. Black and Superintendent F. Wintz. The cars were BT PM BR Stephensons with the latest improvements for animal traction equipment. They were 300 pounds lighter, and quieter and smoother due to springs and running gear. The Magazine Line extension to the exposition grounds “will open Sept. 26” with streetcar service at 6 minute frequencies from 5:15 a.m. to 10:00 p.m. (DT 9/12/1883). Next, the NOC&L announced an order for “46 cars from the Fiegel Car Co. of New Utrect, LI [NY], fitted with the ‘Bemis truck’ [probably a modified PM], Bell stop signal, improved interior lighting. Cars were ordered through J. C. Febiger, Jr. of N. O. Supply & Mfg. Co.” (TD 7/17/1884). One Fiegel car was on exhibition at the Cotton Exposition. Yet, there was no later news item verifying delivery of Fiegel cars. When a car builder has a huge number of orders, it will “contract out” to another builder if possible (see N. O. & Carrollton RR Co. for an example). The disastrous Canal Station fire of 1886, which destroyed all West End coaches and all but one dummy, spared all streetcars! The NOC&L reported 200 streetcars and 800 mules to the SRJ for their annual list of all U. S. and Canadian street railways and steam railroad suburban operations of 1887. Poors in 1889, however, listed only 170 streetcars (reduction not explained) and 825 mules, with 60 miles of track, boasting 48 lb. rails. Incidentally, Poors reported the street railway owned a passenger vessel, the “Bessie M”, a “fast all new boat” that connected West End with Mandeville, Lewisburg, and Madisonville — one of many Lake Pontchartrain steam ships (whose fascinating history must be told) (DP 7/11/1886). NOC&L officers were: President, J. R. Walker; Secretary, W. E. Leverich; and Superintendent, Frederick Wintz, whose career went back to the omnibus era before the Civil War. The NOC&L was reorganized in February 1899, taking its orginal name of New Orleans City RR Co., and becoming the second corporation to have that name. An inquiry to SRJ in 1890 revealed mules averaged a daily run of 18 miles (for a three mile line, making six trips, or three round trips, before relief). A trip might take an hour, for mule cars stopped to load or unload more frequently than once per square. Drivers worked 16 hours, however. The “sugar mule” was most popular for pulling the cars. Four mules per car daily would be needed for that three mile line in New Orleans. However, some places would run a mule for 90 to 102 miles daily, which sounds a bit high. (Requiring a mule to work 45 hours per day! This much does not compute.) Conversely, the six-trip day seems rather light. In 1891, poss. the last order for new BT PM BR streetcars for N. O., from Stephenson, at a cost of $773.50 each (TD 12/22/1891). The last mule car “disappeared from” N. O. in August of 1899 when the Bayou Bridge & Metairie Road line on City Park Ave. “completed electrification” (TD 9/1/1899). Next-to-the-last line was the Girod & Poydras line of the Canal & Claiborne Street Ry. Co., which ended just weeks before, without electric car replacement (which see, page c7). Frederick Wintz was born in France c. 1819. He came to the U. S. in 1830, and was naturalized October 19, 1840 (AN). He began a career in urban public transportation with New Orleans' omnibus lines, and worked with Mr. J. B. Slawson. Their company was the “Rough and Ready” system of omnibuses, probably the city's largest 'bus line. He and Mr. Slawson were closely associated in the formation of the NOC RR Co. in 1859. Mr. Wintz superintended the building of new streetcars for the NOC, all at the Canal Street station, as well as rebuilding cars and overseeing the daily maintenance and cleaning of cars. His steady hand was instrumental in the successful passage of the NOC through the financial troubles and the epizooty plague of 1873 and the expansion of rail service as New Orleans grew. He was active until his death on February 6, 1898 (AN). Copyright © 2008, 2014 Louis C. Hennick. All rights reserved.